Sarah Stirling | Campfires: when and where is it OK to light them? 20 Sep Campfires: when and where is it OK to light them? There is something primeval about watching a campfire. It’s like a lifeline to our forgotten roots in an overconnected yet disconnected world. The hypnotic glow and cosy warmth encourages story-telling, which is, of course, what separated us from the rest of the animal kingdom in the first place. It seems a shame to ask, “Yes, but when is it safe and legal to light one?” But nowadays, with the doom of climate change looming over us, most of us are thinking more about our environmental impacts. This year there have been terrible droughts and wild fires around the world and that’s set to get worse. So it’s also a topical and very important question. In Scotland it’s slightly different, Ben Dolphin, a seasonal ranger in the Cairngorms, told me. The ‘Scottish Outdoor Access Code’ is founded on a lovely principle of responsible access. While this does allow for fires in some circumstances, the code clearly states that you should ‘Never light an open fire during prolonged dry periods or in areas such as forests, woods, farmland or on peaty ground’. In general the Code strongly discourages fires, saying where possible use a stove. If you do light a fire, keep it small, leave no trace and consider yourself responsible if it gets out of control. The problem, explains Ben, is that a lot of people think they know what they are doing with fires. In Scotland, he says, and especially in the glens, much of the ground is peat, which can burn very well. He regularly approaches people who are having fires on top of peat and hears the explanation, “It’s OK, we know what we are doing, we built this ring of stones and have a litre of water.” But the heat actually burns down and outwards underground. Wild fires frequently start this way. Ben said that it can take 20-30 litres of water to put out even a small camp fire on dry, peaty ground. Ben said that while these are obviously better, if it has been dry, even these could be considered irresponsible in some cases and that certainly no BBQ should be in contact with the ground. Ben explained that while beaches tend to be safer spots for fires, some people light them on or close to the dunes rather than down by the tide-line, and this can lead to grass fires and damage to fragile dune ecosystems. He points out that a fire on a riverbed far from vegetation is better than a fire in forest or on peat. 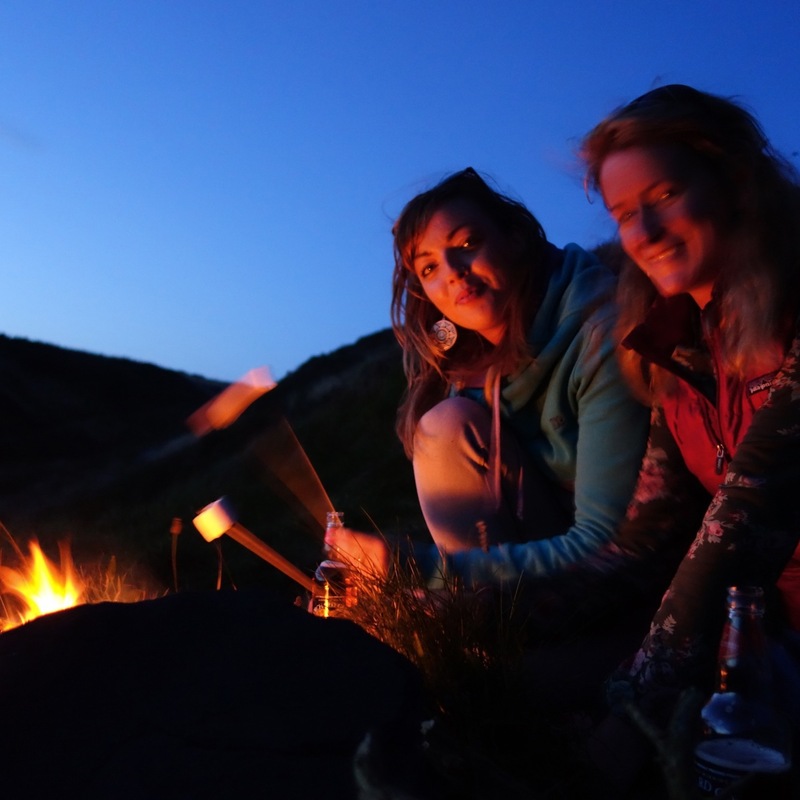 Ben also commented that, as well as making sure you leave no trace after your fire, it is also good practice to try to bring your fuel (wood, charcoal etc) in with you, especially if you are visiting a bothy or popular spot. Dead wood is important in the eco-system as a habitat for lots of creatures. Apparently in a healthy forest around 30% of all the woody material should be dead wood. The proliferation of forest schools are a good marker of how bushcraft is rapidly growing in popularity, hand-in-hand with rising awareness about the environment. Here’s an example of what kids learn: only light a fire if you have the landowner’s permission, dig off the top soil so you don’t damage it, light the fire, keep it under control, then thoroughly douse it out afterwards, poke a hole with a stick under the fire so the water can seep down, stay until the coals aren’t hot any more to touch, take the big bits of charcoal away with you and scatter the remaining ash around the area so it’s not concentrated in one place, then replace the top soil.